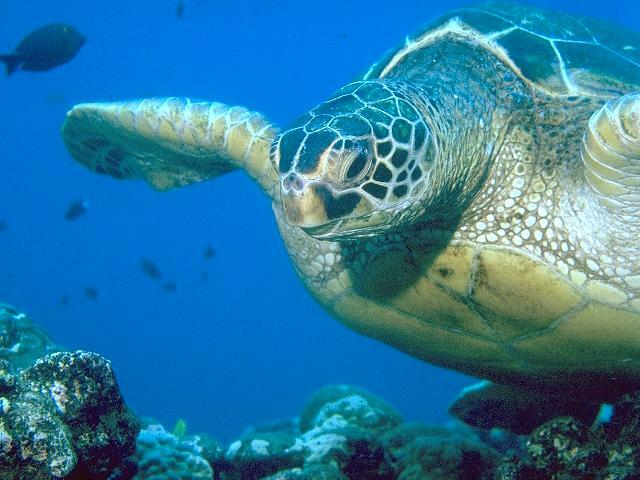 Sea turtles are air-breathing marine reptiles that are said to have been around for well over 100 million years. the Green, the Hawksbill (called in Hawaiian as ea or honu’ea), and the Leatherback (Dermochelys coriacea). The most commonly seen is the Green Sea Turtle (Chelonia mydas) known in Hawaiian as honu. These animals have long been revered in Hawaiian culture representing strength, protection, wisdom, creation, and longevity. Turtles are features prominently in petroglyphs, in the fourth verse of the Kumulipo the Hawaiian creation chant, and ancient stories they often appear as helpers and demigods. The Greeen Turtle can weigh up to 400 pounds when fully mature and primarily eat algae or limu, a Hawaiian seaweed. They are gentle reptiles who live most of their lives in the ocean. They reach sexual maturity after 30-35 years and only then make the vast migration to the French Frigate Sholes to mate, nest, and lay their eggs. Satellite tracking data indicates that they can swim hundreds if not thousands of miles. Males accompany the females on these long journeys and mate with them offshore from the nesting beaches. They nest only at night and spend a lot of time to find the perfect nesting site. The sticky tears they shed while on land prevents their eyes from getting covered with sand and help to remove the excess salt from their bodies. The female deposit up to 100 eggs, in the nest, and then covers them with sand and returns to the water leaving the eggs to incubate for two month’s time. Once hatched these tiny turtles weighing only one ounce take several days to immerge from the sand laden nests. Young Green Turtles are thought to be temporarily carnivorous feeding on the passing invertebrates. After departing the nests they begin a five to ten year journey back to the islands often called “the lost years” because little is known about this phase of their life cycle. 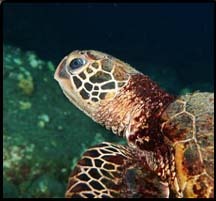 The life span of sea turtles is generally thought to be unknown. They grow slowly and are long lived. Adult sea turtles have two main predators: sharks and people. Tiger Sharks regularly feed on sea turtles of all size. Male and female turtles look alike until they mature and the males develop a long tail that extends beyond the back flippers, while the female tail extends only to the end of her shell. Green Turtles were listed as threatened under the Endangered Species Act of 1978 and it is illegal to harass, harm or harvest sea turtles. Swimmers must keep their distance and respect these revered and ancient Hawaiian residents.